Grand Rapids, Mich. – SpartanNash will honor current and veteran members of the Armed Forces this Veterans Day by offering an 11 percent discount on all eligible products in its 145 corporate-owned retail stores in nine states. 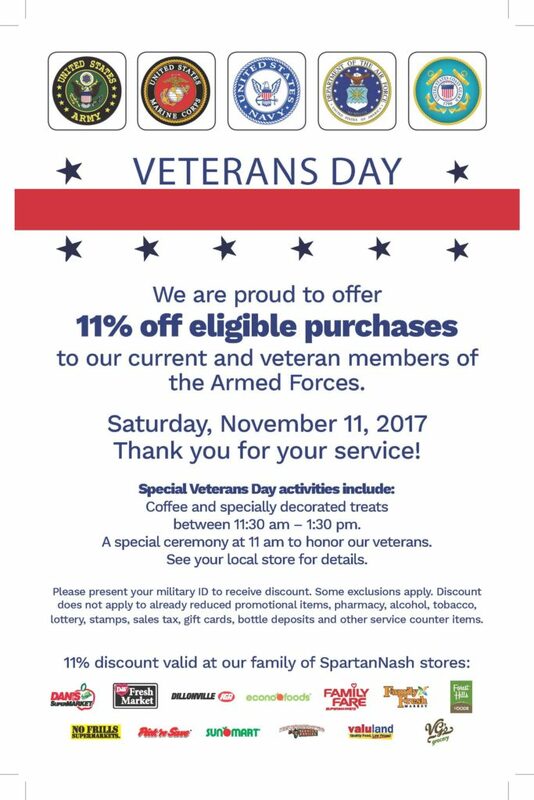 All active duty, Reserve, National Guard and veterans who present proper identification at any SpartanNash corporate-owned store on Nov. 11 will receive an 11 percent discount*. Participating banners include D&W Fresh Market, Dan’s Supermarket, Econofoods, Family Fare Supermarkets, Family Fresh Market, Forest Hills Foods, No Frills, Pick’n Save, SunMart, Supermercado Nuestra Familia, ValueLand and VG’s. Stores that have flag poles will hold flag-raising ceremonies at 11 a.m. on Nov. 11, with local veterans’ groups or Boy Scout troops leading the ceremonies. All stores will hold a moment of silence at 11 a.m. and will offer coffee and specially decorated treats throughout the afternoon. Each of SpartanNash’s 19 distribution centers will also hold flag-raising ceremonies and observe a moment of silence for all those who have lost their lives defending our freedoms. Companywide, all SpartanNash locations also display posters recognizing and thanking associates who are veterans. SpartanNash proudly employs nearly 800 veterans and is committed to hiring, training and retaining current and former members of the Armed Forces and their family members. Because of this, SpartanNash was named a bronze-level Veteran-Friendly Employer by the Michigan Veterans Affairs Agency. In honor of those nearly 800 associates who served or continue to serve, the company will make a $5,000 donation to DAV on Veterans Day. DAV empowers our nation’s heroes and their families by helping to provide the resources they need and ensuring our nation keeps the promises made to them. The nonprofit organization also hosts job fairs and provides free, professional assistance to veterans and their families in obtaining benefits and services earned through military service and provided by the Department of Veterans Affairs (VA) and other agencies of government. On Veterans Day 2015, SpartanNash began collecting old, worn, frayed and/or faded American flags at each of its retail grocery stores, distribution centers and service centers. Each location then partners with a local veterans service organization to ensure the proper retirement of the flags. More than 2,000 flags have been retired through the SpartanNash program. *Please note: The discount does not apply to pharmacy, alcohol, tobacco, lottery, stamps, sales tax, gift cards, bottle deposits, already reduced promotional items and other service counter items.